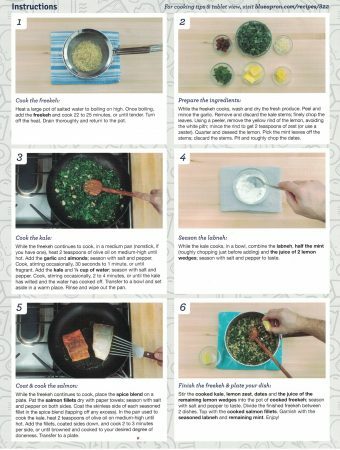 Blue Apron is a nationwide delivery service (for the most part) that sends a box of pre-packaged meal ingredients, farm to table fresh, with the recipes and complete step-by-step “how to” instructions. 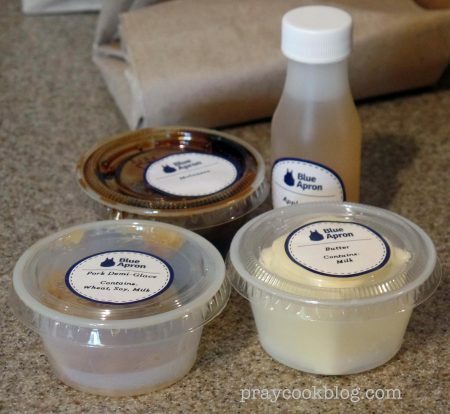 For a price of $59.99 Blue Apron delivers three meals serving two people each. 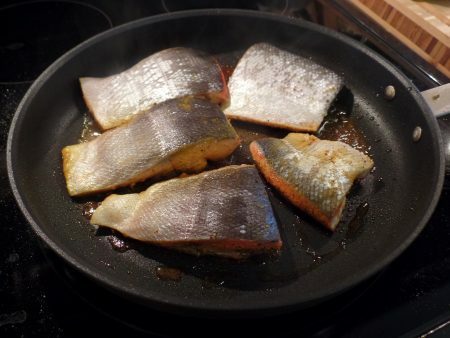 So, for less than the price of a meal out, a really nice gourmet-type meal is prepared at home. Like so many 30-something’s, my kids are very busy between their work schedules and the school and activity schedules of two growing boys! 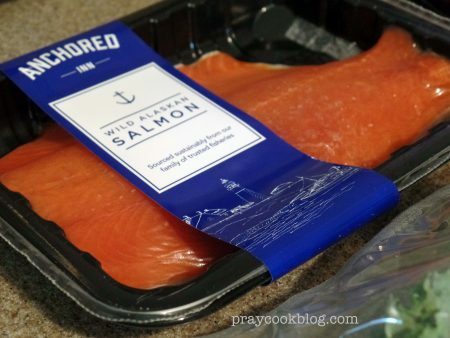 There are several different companies that are now delivering this type of pre-portioned, ready to cook meals. 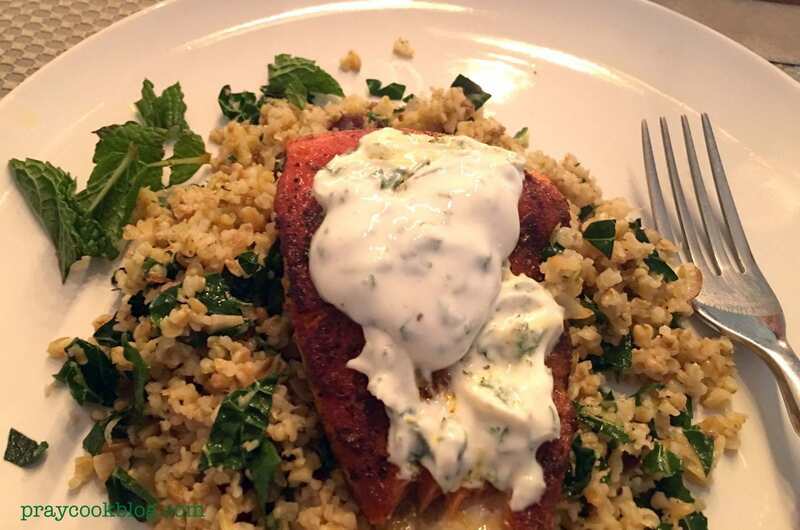 Cory chose this one because of its reputation for high quality, fresh ingredients and good reviews from those who are using the service. 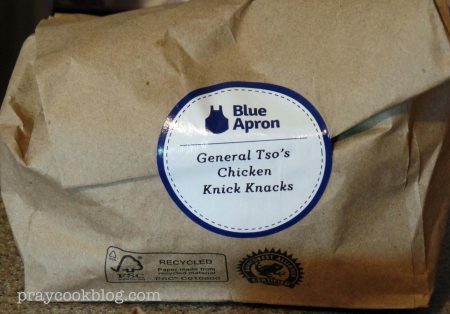 The day we arrived their Blue Apron box was sitting at the front door. 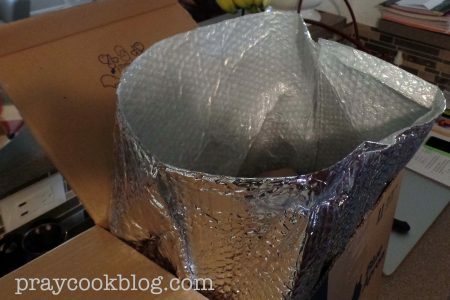 The box is packed with ice and everything comes out very cold and fresh. I took some pictures as Cory unpacked the box. 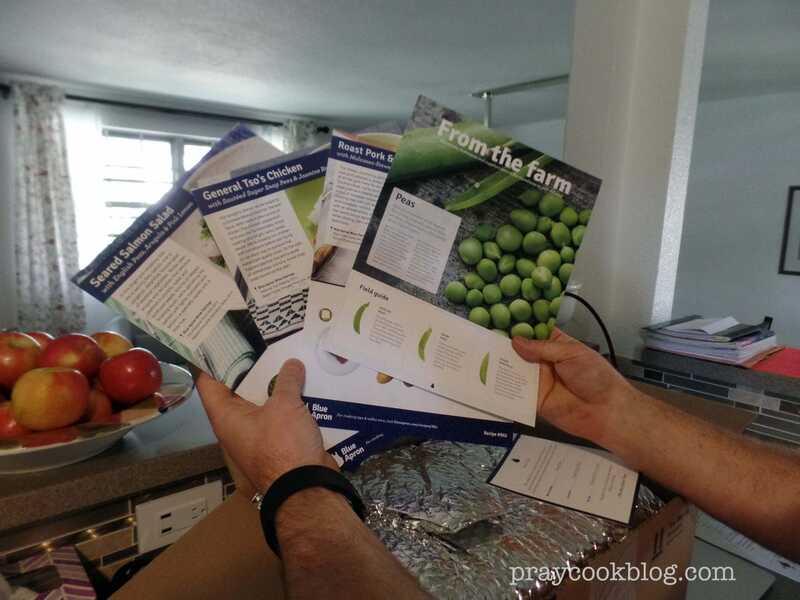 Each box comes with large, laminated recipe cards (fit for a 3 ring binder) with step-by-step instructions. As I hovered around the kitchen saying “can I help? do you need me to do this? do you want me to do that?” Cory politely said, “no thanks mom, just watch and enjoy!” So I got my camera and got busy snapping pictures. 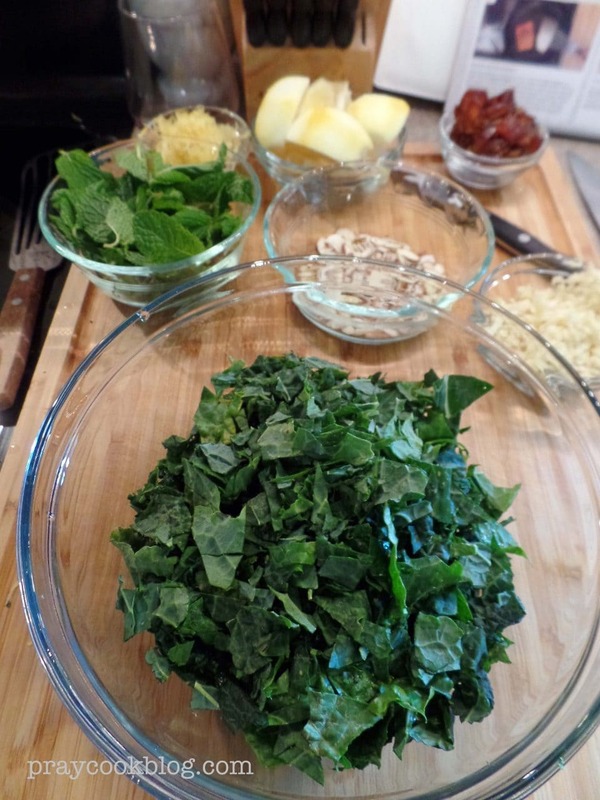 Fresh ingredients ready to cook! 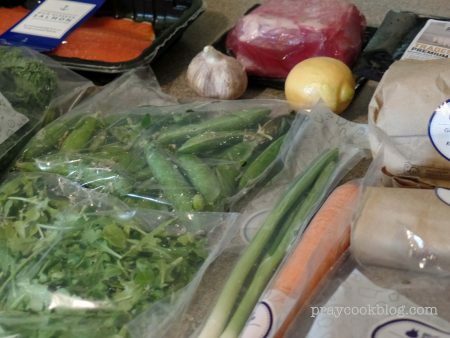 Blue Apron includes everything needed (including every spice) making dinner quite easy. 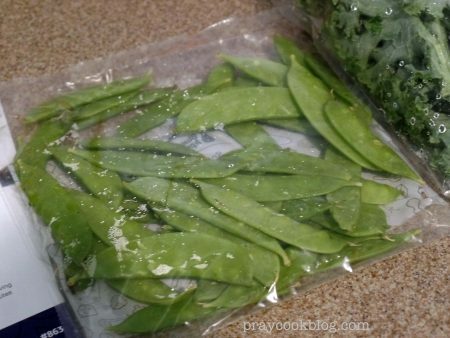 Makes trying new recipes especially easy with no shopping required! 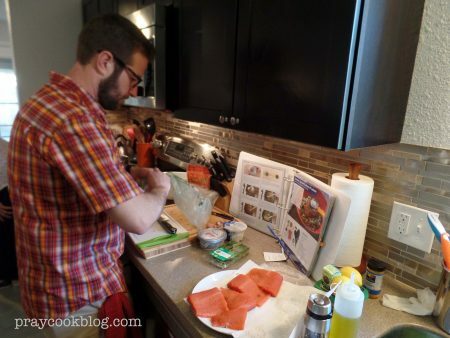 Step by step photos on the recipe card are well-done! 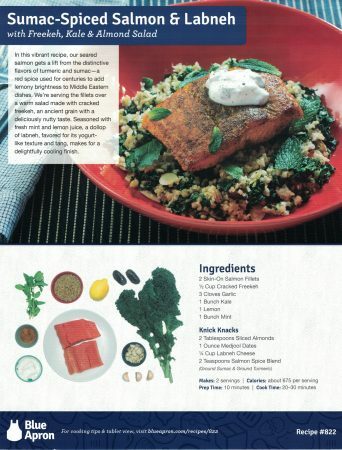 Also, recipes are on the Blue Apron website for anyone to use! 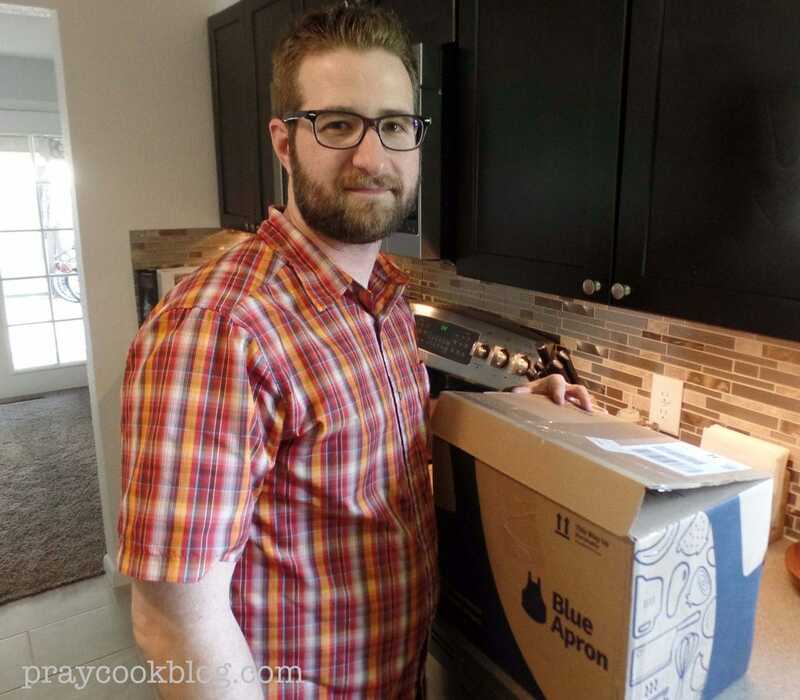 Blue Apron automatically enrolls customers in the weekly delivery plan, but there is an option to skip as many deliveries as desired with no penalty. 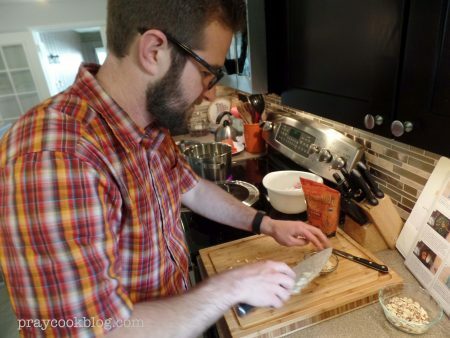 Meal plans are posted a week in advance so you can decide if you want those particular dishes. 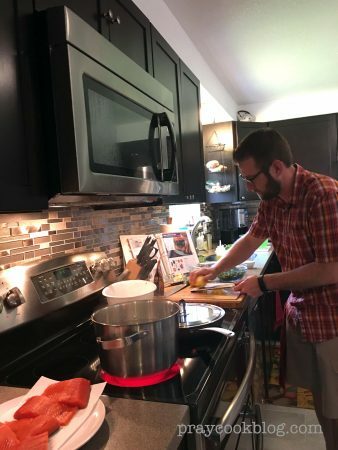 Right now, Blue Apron doesn’t allow any meal choices beyond “meat, fish or vegetarian.” Cory and Ann don’t make weekly choices, they accept whatever is on the menu so that they can try different foods and recipes. In all the meals since February, they have only had one that they really didn’t care for. Cory says it wasn’t terrible, just not a favorite. Might be a little pricey, but also very convenient for busy folks! 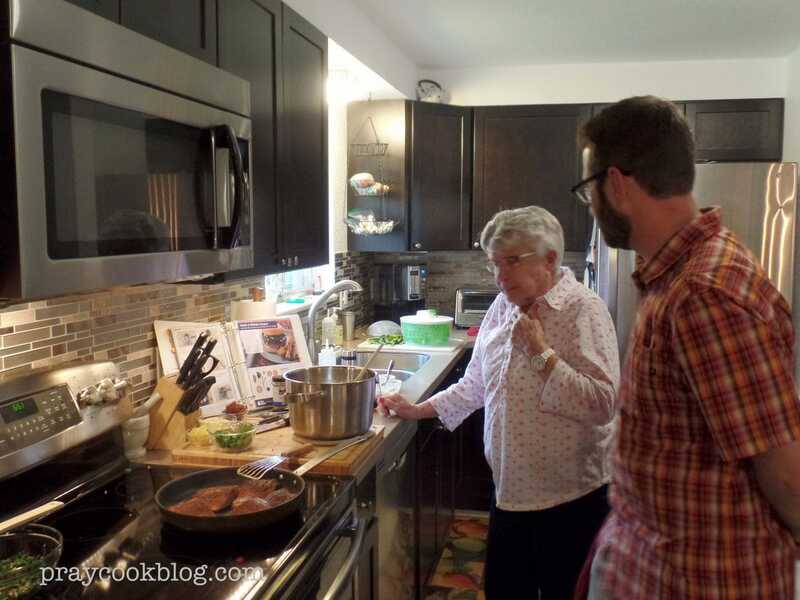 Cory and his sous-chef dish-washing Grandma! My sous-chef dish-washing mom really enjoyed watching Cory create this lovely meal. 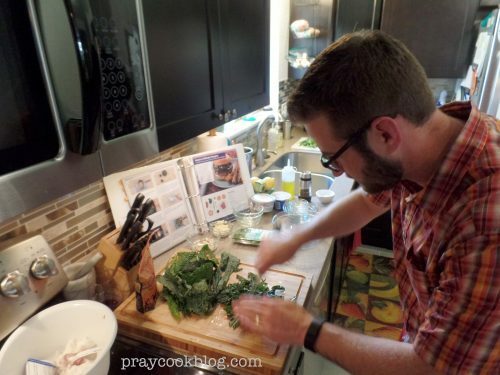 As he plated the dinner the fragrance throughout the kitchen was wonderful. 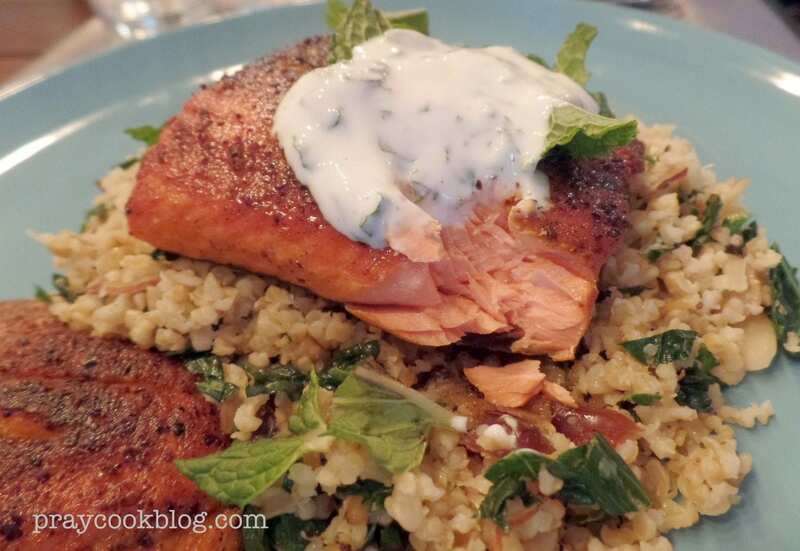 I wish you could just taste a morsel of this fabulous meal! 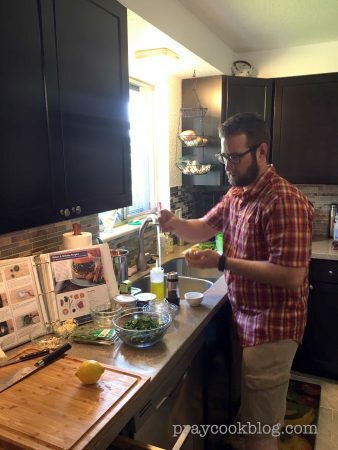 Cory has found that some of the spices used are definitely new to him, but not impossible to find, especially in larger stores or Whole Foods-type stores. 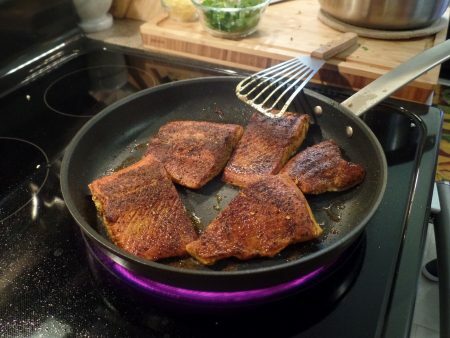 I just had to take this picture after the first bite to show you how flaky and beautiful this pan-fried salmon turned out. Bottom line – I would like to try it, but my frugal self probably isn’t going to give it a go. 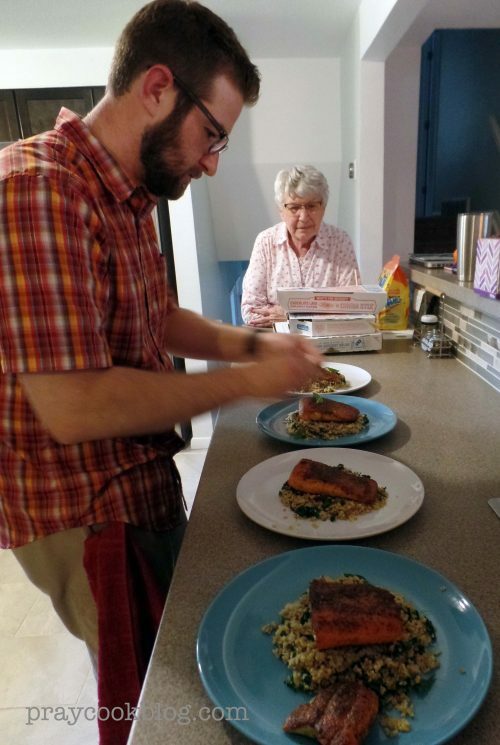 However, I am definitely going to check out the recipes on Blue Apron website and I will continue to cheer Cory and Ann on as they make such lovely, healthy, and delicious weekday meals. Looks like you taught him well! I like that they are willing to try new things. It does make a mother proud to see her son prepare a meal! Back in my day that was unheard of. The meal looked great and delicious ! I’ve done this with two companies–both free or deeply discounted. I’ll tell you my experience when we meet again.